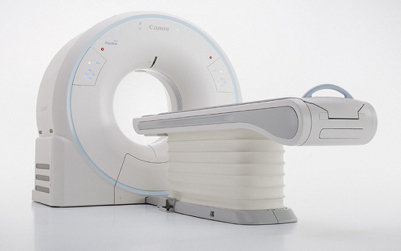 Canon Medical Systems Europe used the venue of Vienna and the 2019 European Congress of Radiology (ECR) annual meeting to introduce an entry-level computed tomography (CT) system to the European market, a 33 MHz ultra-high frequency linear transducer, and software upgrades for its Vantage 3T and 1.5T magnetic resonance (MR) modalities. The Aquilion Start offers the smallest installation footprint in its class, combined with a spacious gantry to accommodate large and obese patients in a small-sized imaging suite. The system provides high-quality 3D CT imaging at the lowest possible radiation dose, and has low-power system requirements. It operates with intuitive controls, a high level of automation, and optimized patient safety, according to Canon. Integrated software technologies highlighted by the Zoetermeer, The Netherlands-based company, include: ADIR (Adaptive Iterative Dose Reduction) 3D Enhanced software offering up to 75% reduction in dose, SEMAR (Single Energy Metal Artifact Reduction) software when imaging patients with metal implants, PUREViSION Detector software to optimize image quality and lower patient dose, and SURESubtraction for e.g. automated bone-free CT angiography. The new 33 MHz ultra-high frequency linear transducer for use with the Aplio i800 ultrasound system is designed to provide extremely fine detail and spatial resolution in the near field, needed for superficial subcutaneous imaging, exams of small joints, superficial nerves, and superficial vascular evaluations The transducer uses iDMS and SMI technologies to provide hifh resolution and detail for B-mode and Color Flow imaging. Smart Sensor 3D allows the user to acquire accurate volume images with the 33MHz transducer, also in SMI mode, and visualize microvascular structures in 3D, which can be helpful during surgical planning. New MRI software enhancements for the Vantage Galan 3T and Orian 1.5T systems designed to consolidate process and improve workflow also made their debut at ECR. Canon said that the workflow enhancements are intended to expand the versatility of MR with faster and higher resolution images. SUREVOI Knee and KneeLine+ allows clinicians to do quick automated localizing scans of the knees to allow for improved workflow. The automated software analysis automatically aligns anatomy for over 95% accuracy in determination and placement of standard knee view scans in just one step. WFS DIXON, significant for workflow in spine and orthopedic MR exams, allows clinicians to take four contrasts in just one scan on FSE sequence, including in-phase, opposed, water, and fat images. This simultaneous acquisition of standard and fat-suppressed images in a single scan can show uniform fat-suppression in difficult-to-shim areas. Quick Star allows for free breathing image acquisition in regions that traditionally require patients to hold their breath. Radial data acquisitions that help with the reduction of artifacts related to motion in the abdomen and any kind of internal motion also allow exams to be completed with fewer breath holds and greater patient comfort. Canon debuts new CT, MR software, US transducer at ECR 2019. Appl Radiol.